This text explores the biology and neurobiology of ageing, pathological conditions such as Parkinson’s and Alzheimer’s disease, medication errors, issues of concordance, long term conditions and the older person, the principles of applied pharmacology and its relationship to older people. Medication Management in Care of Older People will be of interest to health care professionals who either have an interest in medication management and older people, or who are qualified independent or supplementary prescribers, and will enable them to comprehend the principles of applied pharmacology and medication management to enable them to use this knowledge in their daily practice. Illustrates the current issues, concerns and approaches used to manage older people and their medicines. Chapter 1: Older People and Their Medicines: Health Objectives and Health Initiatives. Development of the National Service Framework (NSF) for older people. Building a safer NHS for patients; the role of medication safety. Access to medicines- out of hours. Helping patients and carers to safely self administer medicines at home or in care homes. Community Matrons and the management of medicines. Chapter 2: The Physiology of Human Ageing. Ageing and the cardiovascular system. Changes to the vascular system. Changes to cardiovascular function and control. Changes to hepatic molecular biology. Ageing and the immune system. Changes to organs and tissues. Ageing and the inflammatory response. Chapter 3: The Application of Applied Pharmacology to the Older Person. Factors that alter the absorption of drugs. Pharmacodynamics and the effects of ageing. 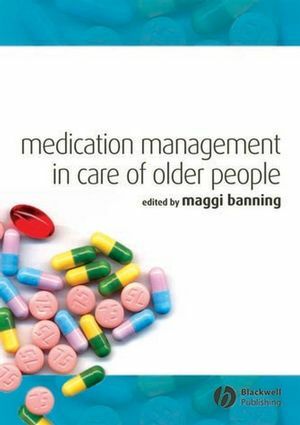 Chapter 4: Medication Management and the Older Person. Medication review and the older person. Principles of prescribing for the older person. Rational prescribing and prescribing support. Chapter 5: Medication Errors and the Older Person. The potential dangers of medication errors. Medication errors that arise due to the supply and administration of medicines. Factors contributing to the development of medication errors. The nurse prescriber’s role in the prevention of medication errors. Chapter 6: Concordance with Medication and Older People. Characteristics of the non-concordant individual. Medication related issues that underpin non-concordance. i. Polypharmacy and complicated medication regimens. iii.Patient comprehension of the need to adhere to prescribed medication. Promoting concordance with medication regimens. The prescriber’s role in the augmentation of concordance with medication for. Comprehension of applied pharmacology and therapeutics. Chapter 7: Neurophysiology, and Neuropathology of Ageing. In search of a nerve cell. Major neurotransmitters in the brain. The dynamic neurone, plasticity and memory. Changes in neuronal activity and communication in the ageing brain. What causes cellular damage with ageing. Pharmacological approach in the treatment of PD. Chapter 8: The Management of the Older Person with a Long-term Condition. Government policy and long-term conditions. The evolvement of the community matron. The education and training of the community matron. Case finding and case management. The future management of older people with long-term conditions. Chapter 9: The Community Pharmacist’s Role in the Management of Older People and their Medicines. Education and training Community pharmacy contractual framework. Services to residential homes Swallowing difficulties Domiciliary visiting schemes. * Illustrates the current issues, concerns and approaches used to manage older people and their medicines.